Homemade frosting is delicious and really easy to make. This recipe comes from my sister and I use it every time I make sugar cookies. It consists of 4 ingredients: butter (using real butter is essential for making a great tasting frosting), powdered sugar, hot water and almond extract. Use vanilla extract if you prefer, but I love the way almond frosting tastes. Start with ½ cup of softened butter. If you don’t have time to let it soften at room temperature, throw it in the microwave for 15 seconds to speed up the process. Be very careful to not let it melt! Add in 3 cups of powdered sugar. It’ll be a little tough to mix, but get it started. Then add in 2-4 tablespoons of hot water, one tablespoon at a time, mixing well after each one. You want the frosting to be easy to spread, but you also don’t want it too runny. I find that 3 tablespoons of hot water gives me the perfect consistency. Add in 1 teaspoon of almond extract and mix well. 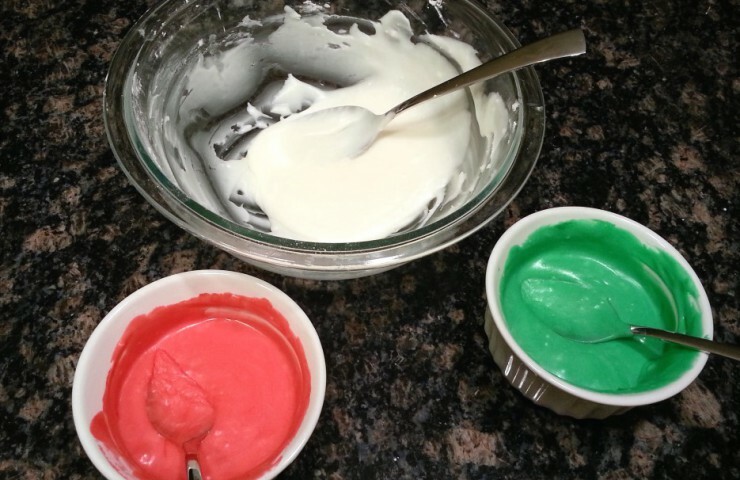 If you want to dye the frosting, divide it up into separate bowls and mix in several drops of food coloring. Stir well so the color is fully incorporated. Now you’re ready to decorate your cookies! In a small bowl, start mixing the butter and powdered sugar. Add in hot water, one tablespoon at a time, mixing thoroughly after each one. When you reach the desired frosting consistency, add in the almond extract. Mix well. 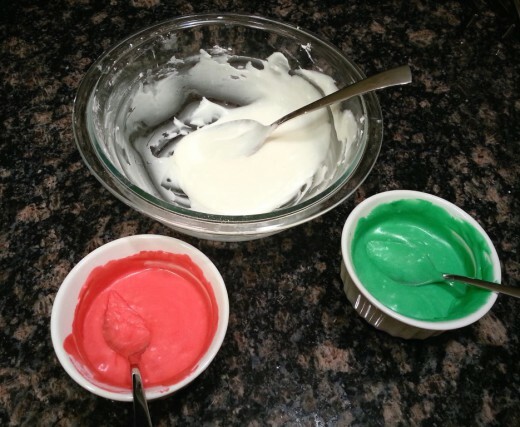 If dying the frosting, divide it between several bowls, add a few drops of desired food coloring and mix.